Single Cylinder Deadbolts are unlocked with a key on one side of the door and a thumb turn to lock it on the inside. 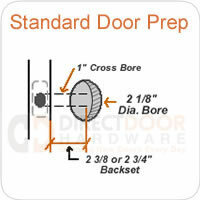 Most exterior doors use a combination of one deadbolt, and a keyed lever handle or door knob. We can key your door locks alike as long as the deadbolts are the same brand as your door knobs or lever handles. Available in PVD Lifetime Brass, Antique Brass, Polished Chrome, Satin Chrome, Satin Nickel, Weathered Pewter, Black, and Oil Rubbed Bronze. 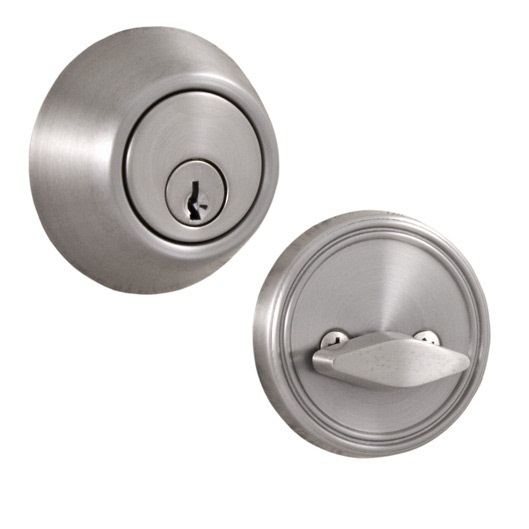 - Adjustable Latches with removable faceplates - 2 3/8" or 2 3/4"
- Adjusts to door thickness from 1 3/8" to 2"
- Two halves of the deadbolt - One keyed cylinder for the outside, one thumb turn for the inside. The lock is not smooth at all. You get what you pay for. Get something more expensive. I wish I had paid to ship them back and got something else. It would have been worth the extra money for shipping. Instead I installed them and am regretting it. I don’t see them lasting long with as hard as they operate already. They also don’t come with long screws for the strike plate. That really makes the dead bolt useless as far as security.